Power users like to tweak their Mac OS X Desktops just so, with that menu color, this background, and those applications in the Dock. Non-computer types just can’t understand the importance of the proper arrangement of your virtual workplace: When things are familiar and customized to your needs, you’re more productive, and things get done faster. In fact, if you’ve set up multiple users on your computer under Mac OS X, the Big X automatically keeps track of each user’s Desktop and restores it when that person logs in. (For example, when you use the Mac, you get that background photo of Farrah Fawcett from the ’70s while your daughter gets Avril Lavigne.) You can produce a Desktop that’s uniquely your own. If you do decide to spruce up your background, you have three choices: You can select one of the default Mac OS X background images, choose a solid color, or specify your own image. All three backgrounds are chosen from the Desktop & Screen Saver panel, located within System Preferences (see Figure 1). Figure 1: To select a background, go to System Preferences. You can also hold down Control, click the Desktop, and choose Change Desktop Background from the pop-up contextual menu (or right-click, if you’re using a mouse with multiple buttons). Apple Images: These default backgrounds range from simple patterns to somewhat strange and ethereal flux shapes. Nature: Scenic beauty: blades of grass, sand dunes, snowy hills . . . that sort of thing. Abstract: Even weirder twisting shapes in flux, this time with bright contrasting colors. Good for a psychiatrist’s office. Solid Colors: For those who desire a soothing solid shade. Pictures Folder: This displays the images saved in the Pictures folder by the active user. Choose Folder: You can open a folder containing images and display them instead. Notice your iPhoto albums in the list? That’s no accident — Tiger automatically offers your iPhoto Photo Library so that you can choose images from your iPhoto collection. Fill the screen. This can be used with a solid color to get uniform coverage. The original aspect ratio of the image is preserved, so it’s not stretched. Stretch the background to fit the Desktop. If your Desktop image is smaller than the Desktop acreage, this works, but be warned — if you try to stretch too small of an image over too large a Desktop, the pixilated result can be pretty frightening. (Think of enlarging an old Kodak Instamatic negative to a 16 x 20 poster. Dots, dots, dots.) The original aspect ratio of the image is not preserved, so you may end up with results that look like the funhouse mirrors at a carnival. Center the image on the Desktop. This is my favorite solution for Desktop images that are smaller than your resolution. Note that this drop-down list appears only if the Desktop picture that you select is not one of the standard Apple images. All the pictures in the Apple Background Images, Nature, Abstract, and Solid Colors categories are automatically scaled to the size of your screen. To change your Desktop background automatically on a regular basis, enable the Change Picture check box and then choose the delay period from the corresponding drop-down list box. 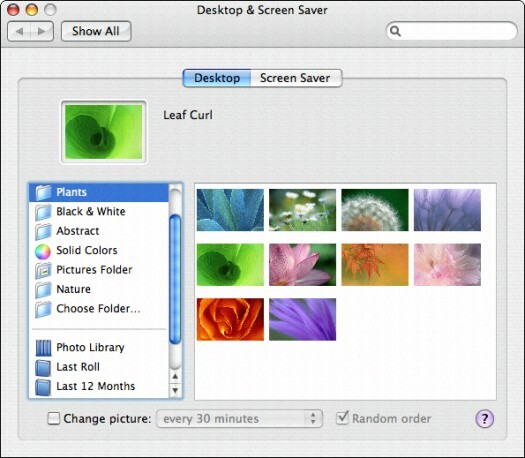 To display the images in random order, also enable the Random Order check box; otherwise, Mac OS X displays them in the order that they appear in the folder. If you want your favorite color without the distraction of an image as a background, you can choose from a selection of solid colors. You can choose from these colors the same way that you’d pick a default Mac OS X background image. You can drag your own image into the well from a Finder window to add your own work of art. To view thumbnails of an entire folder, click the Pictures Folder (to display the contents of your personal Pictures folder) or click Choose Folder to specify any folder on your system. Click the desired thumbnail to embellish your Desktop.